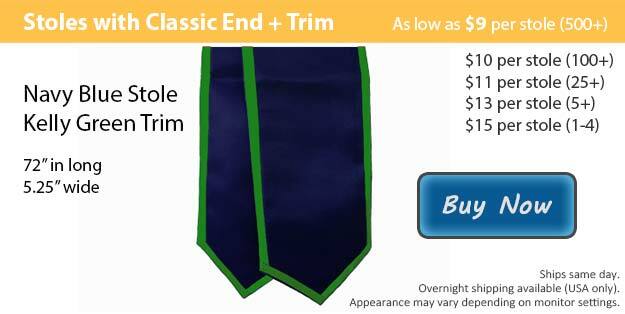 Navy blue stoles with kelly green trim is a terrific choice. The two colors compliment each other tremendously. Graduation is a crucial part of your journey. It is a time when your closest loved ones come from all around to show your their support and just how proud they truly are of you. As your big day grows closer, you'll want to assure that you are fully prepared. It is important for you to look sharp during your graduation ceremony. It has been a tradition for many years for graduating students to wear a graduation cap and gown at the time of their ceremony. A majority of graduates decorate their wardrobe with various types of graduation accessories as well. Here at Honors Graduation we have everything that you need to make your outfit just the way you want. From our convenient deals for the basics like your cap & gown to customized accessories, we have what you're looking for. Our graduation stoles are an exceptional way for you and your group to stand together and for graduates to show their school spirit during graduation. Honors Graduation has a large variety of various graduation stole options. We have two different finishes that you can choose from. There is our angled finish or we have the classic option. We also have over fifteen different colors that you can pick from for not only your trim but the main stole color. Our stoles are also available without the trim as well. Select the best two colors for your stole or keep it a solid color. Each of our various graduation stoles are also able to be customized. If you wish to add an image or wording, our customization team can use embroidery to make your stole perfect. In addition, they also make for great keepsakes to keep on display after your ceremony.